The past 11th Research Data Alliance (RDA) Plenary (21-23 March 2018, Berlin, Germany) - with the theme “From data to knowledge” - brought together data scientists, experts and practitioners engaged in the advancement of data-driven science and economy from across the globe. Prior to the RDA 11 Plenary, the Agricultural Data Interest Group (IGAD) pre-meeting took place with the theme “FAIR principles to all elements of the research process in agricultural sciences and related disciplines”. One of the panels of the IGAD pre-meeting was focused on the achievements of the Agricultural Research Management Information System (ARMIS). A related presentation “Incorporating FAIR data principles in Agricultural Research Management Information System (ARMIS) database in Bangladesh” is provided below in this blog-entry. During the opening of the RDA11 session, Hilary Hanahoe (Secretary General RDA) compared the work done by members of the RDA (Interest and Working) Groups, being aligned, and similar to that of a well-conducted orchestra, working towards the same goal. Opportunities and challenges of a global ecosystem of best practices, standards and interoperable data infrastructures fostering cross-disciplinary knowledge and innovation, were discussed – among many others. The Agricultural Data Interest Group (IGAD) pre-meeting was basically focused on different implementation facets of “FAIR principles to all elements of the research process in agricultural sciences and related disciplines”. For (research) data to have the desired effect of FAIRness (Findable, Accessible, Interoperable, and Re-usable), data publishers/providers and repositories should follow best practices in data publishing, data sharing and in creating common standardised workflows based on open protocols. has to be transformed to knowledge and, consequently, in a digital enterprise to be successful. To this end, support from funders, private sector and governments is needed. One of the panels of the IGAD pre-meeting was dedicated to the topic “Incorporating FAIR data principles in Agricultural Research Management Information System (ARMIS) database in Bangladesh” presented by Rahman Hamidur (Bangladesh Agricultural Research Council, BARC). Even though the agricultural research organizations - specifically, National Agricultural Research System (NARS) institutes and universities - have long been engaged in agricultural research in Bangladesh, the research information was mostly scattered/poorly organized. 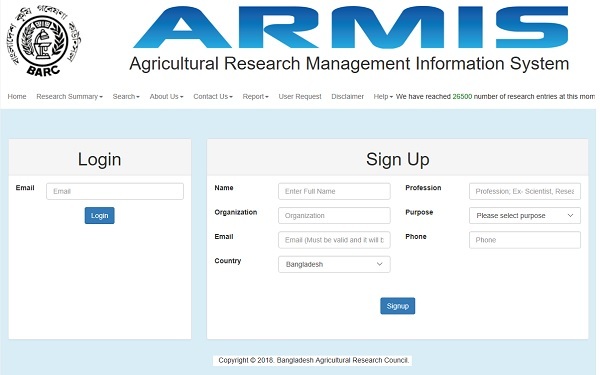 To provide real-time information (based on agricultural research data) in Bangladesh, an online centralized database ARMIS was developed by Computer and GIS Unit of BARC, - for conducting, planning and evaluation of research together with need analysis and draw up new program/projects. ARMIS is expected to act as a decision support tool for the research managers, researchers, academicians, extension personnel and progressive farmers who can utilize ARMIS to identify research needs/priorities and, accordingly, give directions for taking up new research/business related to agri-food sector. helps to avoid wasteful duplication of research, observe research trend in different sub-sectors of agriculture and apprehend investment trend in research. As of April 2018, 26,500 agricultural research data has been deposited into the ARMIS database. ARMIS is going to gradually increase the number of FAIR Facets it complies with, to find and access those agricultural research data in interoperable and re-useable format. that IGAD and its Working Groups have received from the Global Open Data for Agriculture and Nutrition (GODAN), the French National Institute for Agricultural Research (INRA) and Food and Agriculture Organization (FAO) of the United Nations to organize IGAD|RDA11 series of events. If agri-food sector wants to become and remain a global player in data-driven society (read on Big Data in Smart Farming, 2017, in Science Direct), it will have to invest in data management as well as actively participate in global discussions around different data management issues, conducted, for example, by the Research Data Alliance (RDA) Plenaries. It also worth mentioning that the challenges faced by agri-food sector in the Global South are different from challenges faced by Europe, the USA, and well-resourced countries. Although these challenges are different - they all are connected and impact on the other. Where the most conversations of the Global North community are currently focused on how to boost Data Science based on good data stewardship and how to promote Open Science (learn more: European Open Science Cloud; Cloudy, increasingly FAIR; revisiting the FAIR Data guiding principles for the European Open Science Cloud), the Global South countries are mainly discussing on how to use data to improve operational reality of different sectors, including the agri-food sector. Moreover, while the Global North countries have open science/open data policies in place, the Global South has only started the conversation in this direction, hoping to create more awareness of the importance of Open Data policies on national and institutional level (see, e.g., The Big Wins of Open Data for Agriculture and Nutrition, GODAN about Open Data). Following take-aways from the Agricultural Data Interest Group (IGAD) |RDA11 event, it is clear that there are great opportunities for collaboration between the Global South and Global North countries. The upcoming RDA12 : Digital frontiers of global science, as part of the International Data Week 2018 conference (5-8 November 2018, Botswana, Africa) would be ideal for data scientists and researchers from the north to join and explore possible partnerships with researchers from the south. IGAD is going to further boost implementation of FAIR principles in the agri-food-related sectors, also through contributing a data management capacity building framework with IGAD Capacity Development Working Group (read on Case Statement for Capacity Development for Agriculture Data WG).